Pinegrove and I are both from Montclair, New Jersey. There is no avoiding Pinegrove as an indie music fan in Montclair. For a while, that was a blessing. Evan Stephens Hall, the lead singer and mastermind behind Pinegrove, worked at the local bookstore. I grew up playing the same venues with my old punk band that Pinegrove had played when they first started out. I first heard them in 2012, back when they were solely a local treasure. I first saw them live February 12th, 2016, the day Cardinal, their sophomore album and breakthrough came out. After the show, I bought it on vinyl from Evan’s parents and he signed it and we talked for a little. They had generated buzz before Cardinal was released but when it was re-released in June, they really blew up. They opened for Into It. Over It. which at the time was a big break for them, but then they became way bigger than Into It. Over It. (Julien Baker, the other opener of that tour has also gone on to become pretty huge) They played to huge crowds at Panorama, Lollapalooza, Pitchfork, Primavera Sound and pretty much every other major music festival in summer 2017. I saw them three times on the touring behind Cardinal including the release show. 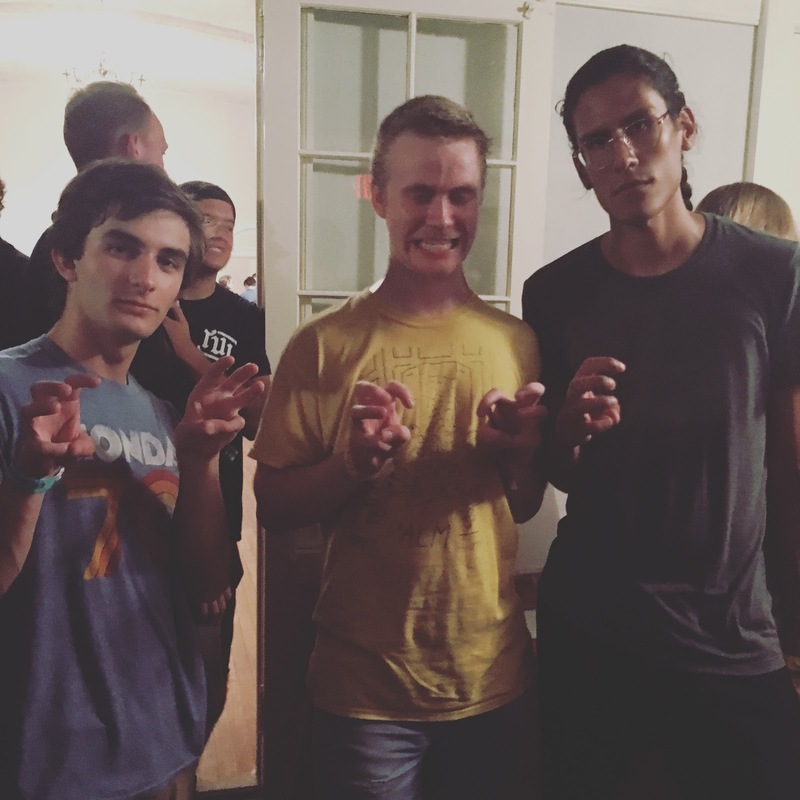 The second time was also in Montclair and I took a picture with Evan and Adan, the bassist, afterwards. The third time, they sold out the Bowery Ballroom in New York City. In Montclair, you expect everyone to know the lyrics and sing along but it was surreal seeing a band I grew up with become huge nationally. Over the summer 2017, they recorded their third album Skylight, which this is ostensibly a review of, and in November, released the first single “Intrepid”. They seemed poised to release a hugely successful indie album. Then, sexual coercion allegations surfaced against Evan. I recommend reading this piece from Pitchfork to learn the full story. Essentially, Evan made a confusing statement regarding the situation and the band went on hiatus. I remember getting ready to head home for thanksgiving break, hearing the news, and walking around a nearly empty Dickinson campus in a haze. How could someone I grew up singing along to and identifying with do something so horrible to another human being? Many Pinegrove fans felt similarly betrayed and shocked. Over the next year, the Pinegrove story was all anyone in the indie scene in Montclair talked about. I know people who know members of the band so I heard information here and there: the album was done but it wasn’t coming out, Evan was in therapy in Montclair, Nandi, the keyboardist and other vocalist and Evan’s foil, had quit to pursue a solo career as Half Waif. Many, myself included, declared Pinegrove “cancelled”. I didn’t listen to their music, as much as it meant to me, for a year until I could hear the full story. On Wednesday, I heard the full story via the Pitchfork piece. What had happened was that Evan verbally coerced someone who was in a relationship to sleep with him. There were not multiple allegations and the victim did not want their story to be public. They merely wanted Evan to go to therapy to address his issues and for Pinegrove to refrain from touring for a year. Pinegrove decided that this was the right course of action and were planning on keeping the situation private via the victim’s wishes. But the organization Punk Talks mishandled the situation and insinuated that there were multiple allegations against Evan and the situation went public leading to Evan’s confusing statement. Buried deep within the article, Evan revealed that they had parted ways with Run For Cover, their label, and were self released their third album, Skylight, on September 28th. I thought long and hard about Pinegrove’s place in my life and if I could morally listen to their album. Since the victim approved of them releasing it and all profits from the album are going to the charities Musicares, the American Foundation for Suicide PRevention, and the Voting Rights Project, I decided that I could listen to Pinegrove again. The album was released a little over an hour ago on Pinegrove’s bandcamp page without any posts to their social media. I’m listening to it for the third time. No one tasked me with writing this and I don’t know how many will read it but it is important for me to write. The album was completed prior to the allegations being made public but some of the lyrics eerily foreshadow Evan’s period of intense therapy, reflection, and rehabilitation. The first line of the album is “I draw a line in my life/ singing this is the new way I behave now/ and actually live by the shape of that sound.” Some of these songs have been in my life for a while. “Angelina” is a re-recorded version of a song they originally released in 2015 and the higher fidelity and more forceful drums do not even come close to majesty of the live version of their Audiotree session. “Paterson + Leo” had been a live stape of the entire Cardinal tour and the new version is vastly superior to the live acoustic version that was included on the European version of Cardinal. I saw them played “Easy Enough” and “Thanksgiving” live and watched a live video of “Darkness” on youtube dozens of times. “Easy Enough” and “Darkness” both make for perfect movie montage road trip songs. “Thanksgiving” loses some of its charm in the sober album rendition. Revamping old songs is not new territory for Pinegrove: Cardinal included a new version of “Size of the Moon” one of their oldest songs and Meridian, their underrated 2012 debut album, included a re-recording of what I still say is their best song “The Metronome”. Speaking of best songs, my favorite new song “No Drugs” is not on Skylight. As much as I love Cardinal, Pinegrove are best live. Though guitarist Sam Skinner is a talented mixer and producer, (his father Steve Skinner is a profession producer and worked on the hugely successful broadway show Rent. I used to be pretty close to Sam’s sister and have talked to Steve a lot and he even gave me his pocket Constitution.) Cardinal had a messy lo fi sound that I assume is intention homage to their 90s alt country and mid aughts Saddle Creek influences. Skylight is similarly lo fi, though the drums are much cleaner than on Cardinal and hints of keyboard and dreamy guitar effects creep into songs as opposed to the banjo and slide guitar of Cardinal. My biggest problem with Skylight is how similar it is to Cardinal. Obviously, the four years between their first and second albums gave Pinegrove more time to change their sound than the year and a half between Cardinal’s released and the recording of Skylight but half of the songs on Skylight sounds like they could be outtakes from Cardinal. Early single “Intrepid” is one exception, utilizing a proggier sound with less emphasis on Evan’s vocals. The title track introduces prominent acoustic guitar into the mix alongside swells of guitar feedback and brushed, muted drums and as a result is one of the highlights of Skylight. “Amulets” clocks in at a minute and uses quiet deep synth with slide guitar. It doesn’t have much of a tune though and ends before the song can build up any momentum. “Light On” embraces Pinegrove’s country and classic sixties pop influences in a way unheard on their studio albums. Evan’s father Doug contributes piano and vocals and though the piano is poorly recorded, it gives the track a bar closing vibe. I think if I came to Skylight without the moral burden of Evan’s actions and without the year long crisis of fandom that came with it, I would be much more likely to slather praise onto Skylight. It is a very good album to my ears, but seeing them debut the songs from it live like how I heard Cardinal would have made me love it. Knowing what I know now about Evan, I’m not sure I’ll ever be able to connect with his music in the same way. In the year since I stopped listening to Pinegrove, I moved away from listening to the indie music that I grew up with and moved more toward hip hop, experimental, and electronic music. After diving deep into stuff like MF Doom, My Bloody Valentine, and Daft Punk, Pinegrove sound quaint by comparison. I recommend listening if you like stuff like Mitski, Hop Along, Front Bottoms, AJJ or any other emo band. Tune in next week for my thoughts on the new Kanye West album YANHDI and in a few months for the second edition of my top ten albums of the year roundup.